Lest anyone think the MTA funding crisis is over, it is not. Many of our elected officials are patting each other on the back for averting a full scale meltdown, but the can has just been kicked down the road. And while the fare hike is not as dramatic as feared, fares are going up more than 10% next month, with projected increases every year. We're keeping our buses - for now. But we still do not have a funded 5 year capital plan. And now we learn that many station agents, who provide a human presence in the system, will be cut. Comptroller Thompson's office has a handy tool you can use to see how your local station will be affected. As an example, the Carroll Street station is set to lose 1 part time station agent from the cuts. No station agent means no one to release the gate when you need to get a package or stroller through. No one to answer questions about service outages or directions. No one with a line to call for aid or report suspicious/criminal activity. I'm a believer in adding cameras to the subways for security, and in adding computer based train controls to improve efficiency. But station agents provide a valuable human element to the system that is hard to quantify, but improves the safety, accessibility and convenience of the subway system. These cuts are penny wise and pound foolish, but they are being forced by the same Assembly and Senate members who failed to pass a real transit funding bill this year. It has become fashionable to blame the MTA for all manner of shortcomings - but the fault lies in Albany. Only your elected officials can fix the problems our system faces. Demand it! IND and CBID are co-hosting a panel of candidates for the 39th Council District tonight at Church of Gethsemane in Park Slope. 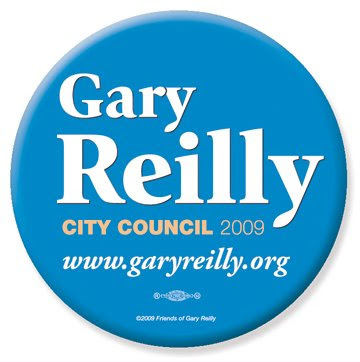 This blogger, also known as Gary Reilly, will be among the candidates. Come check it out! F Train to 7th Ave. Front of Coney Island bound train exits to 8th Avenue, rear of Manhattan bound train exits to 8th Ave. I've been down for a few days with a bug. Swine flu? Captain Trips? SARS? In any case, it beat me down quick but I'm back on my feet as of today. But before I was floored by that malignant pathogen, on Saturday Mia and I spent a few hours helping to spruce up Carroll Park with the Committee to Improve Carroll Park and other volunteers. I posted a few iphone photos online in a public album. Check them out here. Thanks to Glenn, Katia, Sara et al, as well as NYC Parks Department for organizing this and giving us an opportunity to help out.